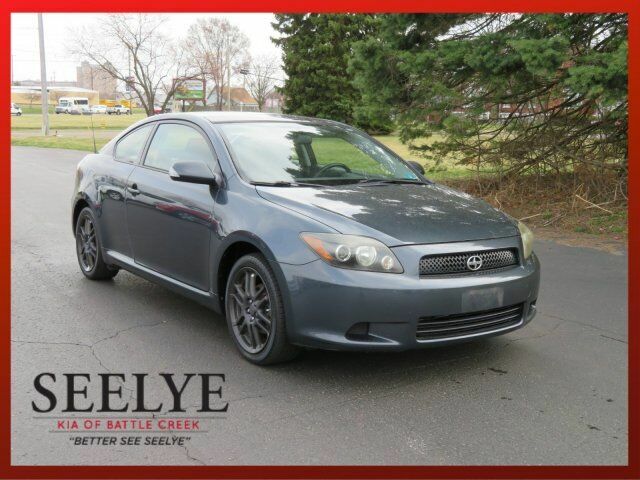 This 2008 Scion tC is equipped with luxury car-level features. WHEEL LOCKS, Variable intermittent windshield wipers, Tire Pressure Monitoring System, Temporary spare tire. Remote keyless entry w/electronic rear hatch locking system, Reclining 60/40 split folding rear seat, Rear window defogger, Rear fender-mounted antenna, Pwr side mirrors w/turn signal indicators, Pwr door locks, Pwr assisted rack & pinion steering, Outside Temp Gauge, Instrumentation-inc: tachometer, trip meter, Independent MacPherson strut front suspension, Independent double wishbone rear suspension, Halogen headlamps w/auto-off, Front wheel drive, Front ventilated disc/rear solid disc brakes, Front seat mounted side airbags, Front & rear head curtain airbags, First-aid kit, Fabric Seat Trim, Dual pwr outlets, Driver/front passenger visor vanity mirrors w/cover. As reported by KBB.com: If you were a long-time fan of Toyota's discontinued Celica, you'll like what Scion has done with the tC. Its robust power, long list of standard equipment and low base price are exactly what young consumers are looking for in a fuel-efficient sports coupe.